Ghanaian actress Joselyn Dumas has denied ever stating that she once dated John Dumelo. Reports were everywhere last week stating that the curvy actress confirmed past rumors that she was involved in a romantic relationship with the actor. This was due to an interview she had with Abeiku Santana on his ‘ATUU’ show. 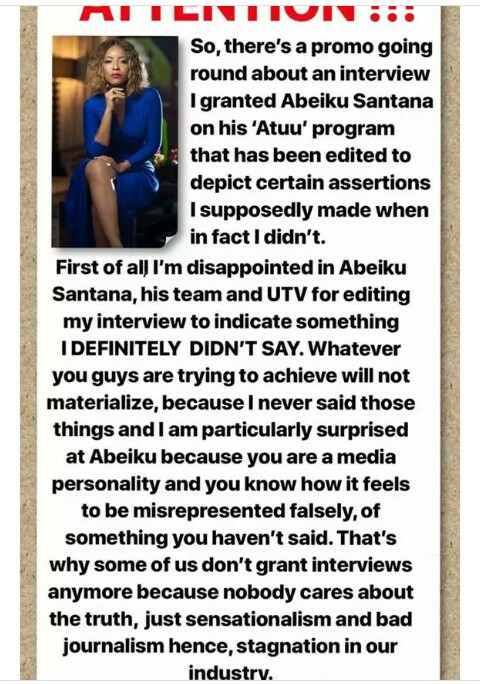 Reacting to the reports, Joselyn released a statement with claims that the interview was doctored to say what the interviewers wanted the public to know. In the interview, Joselyn Dumas stated that she never dated John and that she only grew fond of him after they featured in about 3 movies back to back. That close relationship made them become very good friends. “I never dated John Dumelo. I didn’t have a crush on John Dumelo. However, I got fond of him. He became my very good friend. We were friends, he liked me and I also liked him and that was it,” she said in response to Abeiku’s question if she ever dated John. 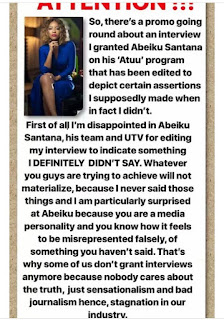 Joselyn Dumas further stated that the falsehood portrayed by those who interviewed her is one of the reasons why herself and some of her colleagues don’t grant interviews anymore because of the fear of being misrepresented falsely.